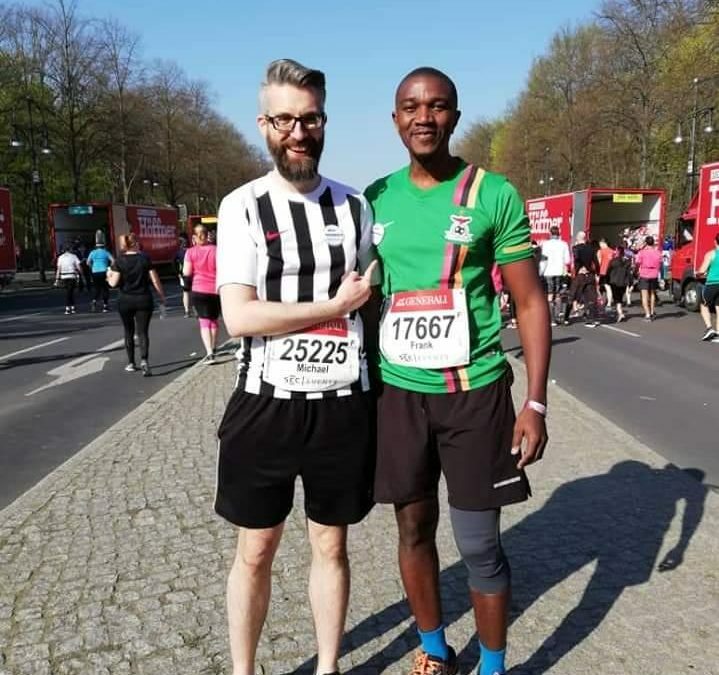 Zambia’s Ambassador to Germany His Excellency Anthony Mukwita has paid tribute to German-based Frank Katebe for his initiative to participate in the 2019 Berlin Half Marathon covering 21 kilometers. Ambassador Mukwita said Katebe’s participation contributed to efforts needed to make Zambia visible at every given opportunity. He said an international event such as the Berlin Half Marathon presents a perfect opportunity to raise Zambia’s flag. “When we represent Zambia at such international events, the name becomes familiar with would-be tourists, with would-be investors and prospective employers such as the United Nations and other international business houses”, said Mr. Mukwita. The Zambian envoy said Katebe’s participation was a reiteration of President Edgar Lungu’s call on all Zambians wherever they may be to remember that they were all Ambassadors for their country. He said they were therefore expected to seize every possible opportunity to make their country visible. Katebe was cheered on as he drew to the finish line by his wife Jana and some members of the diplomatic staff from the Zambian embassy. Thousands of onlookers lined up a section of the road at the finish line where a DJ blasted popular songs that the crowd sung along to. Katebe ran under his chosen theme, “Let’s help Mozambique” as part of efforts to bring attention to the plight of the victims of the deadly Idai Cyclone that left hundreds dead and damage estimated to run in millions of dollars. Recently, the Zambian government responded by sending medical supplies joining other international players who are assisting the Mozambican government mitigate the impact of the cyclone. During last year’s Berlin half marathon, a total of 61,390 participants representing 133 countries participated. 40, 775 managed to finish the race among them 28,443 men and 12,332 women. The finally tally for the 2019 Marathon are yet to be finalized as the race was ongoing at press time. Last year, a Zambian female participant, Maya Mwanawasa ran in the BMW-sponsored Berlin marathon. Both Katebe and Maya are not professional athletes but participated out of personal interest. For the 2019 half marathon, the finish line was at the Brandenburg Gate, which once served as a dividing line between West and East Germany. It was here that the former US President Ronald Reagan on June 12, 1987 made a speech with the famous words, “Mr. Gorbachev, open this gate! Mr. Gorbachev, tear down this wall!” Two years later in December 1989, the gate was opened. As marathon participants came through the gate, the wild cheers were reminiscent of 30 years ago in November 1989 when hundreds of thousands of people gathered to celebrate the fall of the Berlin Wall.